Pi Dollars ! That‘s what you will earn each time you participate in a Pi event. Show up and collect, volunteer and get paid, or lead a project and fill up you account; it couldn't be easier! At the October 2006 Pi Board of Directors meeting, we discussed door prizes available for upcoming general meetings. Bill Bailey has obtained from Peach Pit and O’Reilly Press several top quality books for distribution to members of the Pi. In the past, we simply laid out these valuable books as door prize winnings and the best were quickly scarfed up. Those who ended up having their names drawn last were getting nothing they really wanted. We want to change that. So we put our heads together to try to match the right book (or other prize) with the right person, with a goal of everyone having a chance to be a real winner. Wondering how we could do this, Pat Fauquet chimed in, “Pi Dollars.” That’s it! We will auction off the prizes and since we can’t do it for real money, we will create our own. And, now, those with enough Pi Dollars will be able to bid to their hearts content to “win” the prize of their choosing. 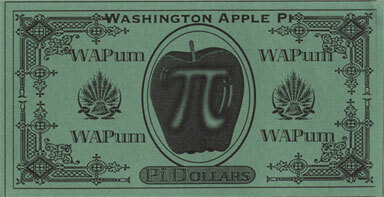 And how do we get this Pi currency into the member’s hands? Easy! Every time any member (you must be a Pi member) participates in one fashion or another in most Pi activities, they will earn a prescribed number of Pi Dollars. Activities such as attending the general meetings or the mini-meetings at the Apple Store, volunteering to help with or lead an activity, SIG attendance, giving a presentation, or writing an article for the Journal are examples that will merit reward. Early Bird renewals can be another way to earn this Pi money. Note: Values may change without notice as we reserve the right to ensure adequate compensation for each activity. Additional terms and conditions may apply.